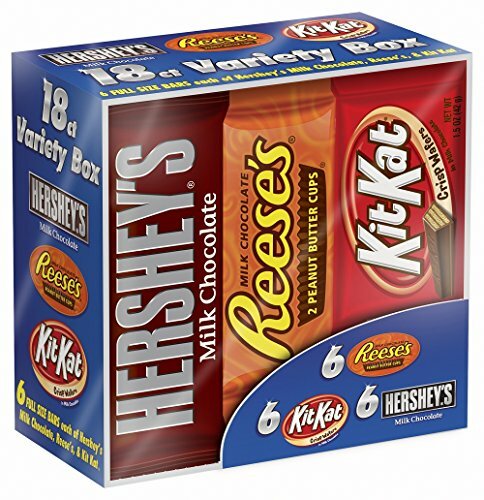 Amazon has a new deal on the Hershey Candy Bar Assorted Variety Box (HERSHEY’S Milk Chocolate, KIT KAT, REESE’S Cups), Full Size, 18 Count which is on sale for $11.84 (reg. $12.59) but when you clip the 20% off coupon the price drops to only $9.47! Make this deal even better and save up to an extra 15% off when you Subscribe & Save making the price as low as just $7.70 or 43¢/bar shipped! (4) Pay as little as $7.70 shipped!